With little fanfare, state governments have been digitizing their historical archives and putting mountains of new information online. A new website called, logically enough, Digital State Archives, is beginning to sort through this newly-available content, and highlight the crème de la crème. Happily, a good deal of state archive materials are valuable resources for genealogists. 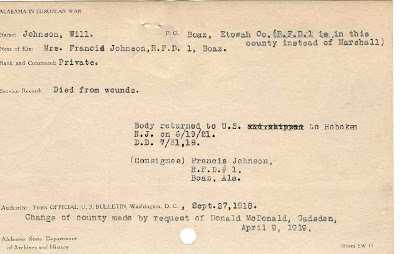 Alabama's Archives include online records of Civil War and World War I soldiers, as well as an 1867 Voter Registration database including thousands of newly-registered ex-slaves. Alaska's archive collections include probate records, an index to pioneers, and a large collection of obituaries from historical newspapers and magazines. Over at the Illinois Archives, you'll find cemetery internment records, online newspaper archives, and a scary clown! The good folks at the Minnesota Archives, bless their archival hearts, have consolidated many of their historical name lookups into a single Minnesota People Find search page. New York has a wonderful collection of the Harlem Hellfighters WWI Muster Rolls, and a huge Civil War database, while their archiving neighbors in Pennsylvania have their own collection of military records dating back to the Revolutionary War. These links just skim the surface, of course. So much online material is available, and so much is continually being added, that state archives should be a regular internet stopping point for anyone serious about family history research. MOMS is a statewide web application used to search all marriages in MN.